Quickly customise hundreds of metal items with photos, logos and personalised text. 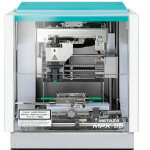 Perfect for kiosks, gift shops, retail stores and industrial applications, the new METAZA MPX-95 photo impact printer is a low-cost, easy-to-operate device that anyone can use to personalise high-value items, making them even more unique and profitable. Personalising flat or curved surfaces of high-value materials like gold, silver, platinum, stainless steel and titanium has never been so easy. With no metal dust, no mess and no complicated operation, the MPX-95 is a machine that imprints fast and efficiently and produces photo-realistic results. The MPX-95 uses a durable diamond-tipped stylus that strikes the material with high speed and precision to reproduce the most delicate gradations and finest fonts. The results are exceptional, with detailed graphics and fonts that stand out. Users can expand the MPX-95’s profit-making potential by simply unclipping two hook fasteners. In seconds, the base of the MPX-95 can be removed to enable it to imprint onto large and unique items such as golf clubs, metal vases, urns and more. The MPX-95 further expands personalisation possibilities with an optional Gift Kit of accessories. A built-in laser pointer instantly defines the origin point on media before imprinting for accurate personalization. The MPX-95 photo impact printer runs quietly, cleanly and safely in any gift shop, retail store, kiosk or manufacturing environment. As a compact and portable device, it can be taken anywhere and used to produce souvenirs at weddings, craft fairs, pet shows and other special events.